Western Isles MSP, Alasdair Allan, welcomed news that the Scottish Government is in talks with a Canadian manufacturer about potential replacement planes for the Isle of Barra. Transport Minister, Stewart Stevenson, flew in to update community representatives with progress on the issue at a meeting in Northbay hall yesterday. "The Transport Minister was able to confirm that the Scottish Government are now in talks with the Canadian aircraft manufacturer Viking about potential replacements for the two ageing twin otter aircraft which provide the link from Barra to both Glasgow and Benbecula airports. "The number of commercial aircraft which can land on a beach is, of course, extremely limited, and it is welcome news that talks are underway about replacement. "While no contracts have yet been signed, it is very promising to hear the Transport Minister give the Scottish Government's clearest ever commitment to ensuring that Barra airport will continue to function into the future. "This now also effectively makes the Government's view plain that replacing the existing aircraft is a far more realistic option than trying to build a fixed runway. "I look forward to working with the Scottish Government on this issue and will keep up the pressure for further progress. "Obviously much depends on decisions to be taken in the next few months about what Scotland has to spend in these times of financial constraint. However, now that it is clear the Government are in detailed conversations with a manufacturer, this project looks very much more hopeful." Further advance work begins today at a number of sites along the Gala Water to support the delivery of Borders Railway. Work will be carried out at Shoestanes and Burnhouse – where the railway will run adjacent to the Gala Water to protect and maintain the existing railway embankment by placing large stones at key sites on the river to slow the flow of water and prevent erosion. This Scour Protection work is being undertaken by Scottish Borders Council’s SBC Contracts and is the second phase of this work on the Gala Water. It will be carried out over September and October and continues the advance work which began in March this year when the Waverley Railway Act was triggered marking the start of the railway construction. "Scottish Borders Council are proud to be managing this work on behalf of Transport Scotland. Having been involved with the railway since its inception we are delighted to play our part in helping with the construction of the project which is a vital development for the long term sustainability of the Borders economy. All of the advance works and the work being done by Transport Scotland will mean that it will not be too long now before Borderers can enjoy being linked to the rest of Scotland as part of the rail network." Advance work already carried out has included the diversion of a 1.5 km water main from the old railway trackbed in Stow together with other utility diversions in Dalkeith, Cowbraehill and Galashiels. 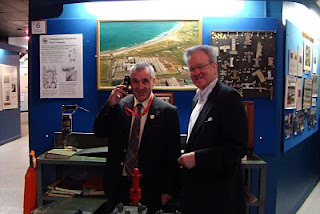 Fraserburgh’s SNP councillor Brian Topping and local MSP Stewart Stevenson dropped into the Heritage Centre Open Day on Saturday morning to show support for the facility and the dedicated team who run it. Mr Stevenson and Cllr Topping met with volunteers and staff and toured the exhibition. 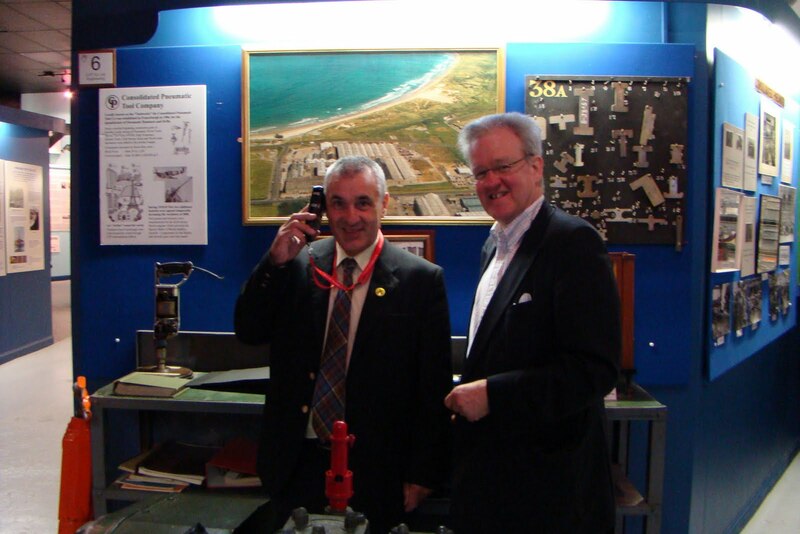 “The Fraserburgh Heritage Centre is a remarkable facility and is well-worth a visit. “It is full of fascinating items and exhibits about the Broch’s history and provides quite an eye-opener into Fraserburgh down through the ages. “The Broch Heritage Centre is particularly good for children as there’s a lot of the exhibits you can actually touch and get close to. I know I enjoyed doing so! Works on the Pulpit Rock section of the A82 took a major step forward today. Transport Minister Stewart Stevenson announced that Transport Scotland had published draft road orders for work on the A82 at Pulpit Rock to finally remove the traffic signals and upgrade the section of road to re-introduce free flow of traffic. The Transport Minister made clear that this work coupled with the recent opening of Stuckindroin Bridge and the forthcoming maintenance work between Tarbet and Crianlarich to resurface the carriageway and carry out other road safety improvements was tangible proof of the Government’s continuing commitment to upgrade the A82. “The A82 is an economic and social lifeline for the communities and businesses of the western Highlands and Islands, which cuts through some of the most challenging terrain in the world. “Since 2007 the Scottish Government has completed, or is in the process of delivering, £32 million of improvements on the road. I am delighted that we are now able to publish the draft orders for the important works at Pulpit Rock, a section of road that has frustrated motorists for over 30 years. “These works will require the road to be closed for up to 14 weeks, a reminder that the road is wedged between Loch Lomond and the steeply sloping hillside and any works on it will provide real engineering challenges. The A82 is the main road link from Glasgow and the Central Belt to Fort William, the Highlands and the Western Isles. It is an important part of the Scottish Trunk Road Network and efficient operation of the road is essential for access to the Highlands and Islands. A public exhibition of the Pulpit Rock Improvement scheme proposals will be held at Ardlui Hotel, Ardlui, Loch Lomond on Thursday 30th September 2010 from 12:00pm until 8:00pm. For further details of the project and for copies of the orders and environmental statement see A82 Pulpit Rock Improvement project. 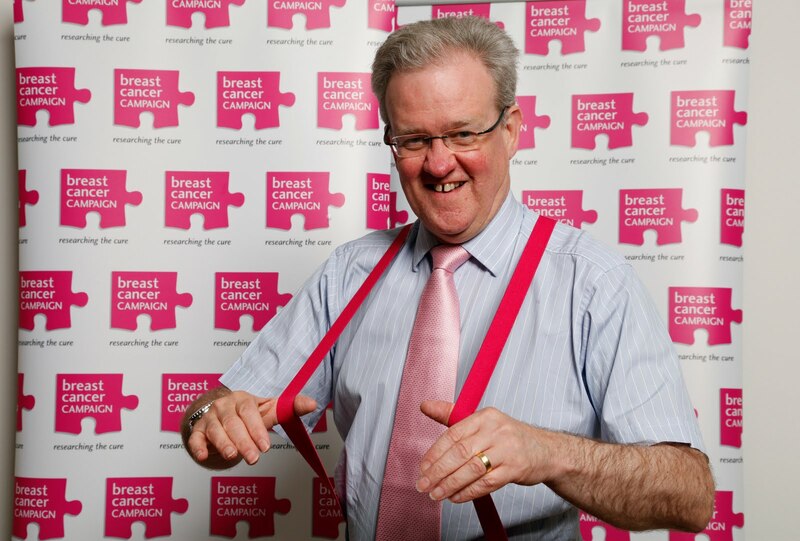 Stewart Stevenson MSP for Banff & Buchan is joining forces with Breast Cancer Campaign to raise awareness of its award winning fundraising event, wear it pink day, supported by Vanish. On Friday 29 October 2010 supporters in schools, colleges and businesses throughout the country are encouraged to don an item of pink in support of Campaign and each donate £2 to fund innovative world-class breast cancer research. To take part in the UK’s original and best pink day call freephone 0800 107 3104 or visit http://www.wearitpink.co.uk/ and register to receive your free fundraising pack now. wear it pink is supported by Vanish, which has committed to raising an incredible £250,000 for the charity this year. Banff & Buchan MSP Stewart Stevenson will carry out the official opening of Peterhead’s latest retail store Partridge’s at 27 Broad Street, Peterhead, on Monday 4 October at 1.00pm. Mr Stevenson will be joined by Director Hamish Partridge. Partridge’s is located in the former M&A’s shop in the town centre which closed recently when the business-owner retired. It is the firm’s third retail outlet in Buchan with others in Turriff and Fraserburgh. “I am delighted for Partridge’s that they have expanded again, this time to Peterhead. It is a welcome boost for Peterhead town centre and a vote of confidence in the town. “Partridge’s have proved themselves to be a very innovative company and I’m sure that shoppers in Peterhead will very much welcome the new shop, bringing as it does an added dimension to the town. Scotland has set a clear path to achieving its target of reducing emissions by 42 per cent by 2020 after a draft order to set annual emissions targets for 2010-22 was laid in Parliament today. The targets proposed in the draft order take account of advice from the Committee on Climate Change (CCC) and the deliberations of a cross party working group over the summer. "Scotland has the most ambitious climate change legislation anywhere in the world and these annual targets set a clear framework for achieving our 2020 target. The targets go further than those recommended by the UK Climate Change Committee and reflect a number of meetings of the cross party group. "If Parliament agrees the new Order, we will present a draft Report on Proposals and Policies (RPP) to Parliament for consideration which will set out how we plan to reduce emissions. We have aligned our preparatory work on the draft RPP with our preparation of the draft Budget and we expect to provide Parliament with the opportunity to consider both key documents in parallel. Consideration of the RPP alongside the draft Budget will ensure that, in demanding financial circumstances, Scotland can take economic advantage of the opportunities required to reduce emissions. "As a country we are making excellent progress towards achieving our world leading climate change targets and recent emissions figures show Scotland has reached the halfway point in achieving its 2020 Climate Change Act target of reducing emissions by 42 per cent." 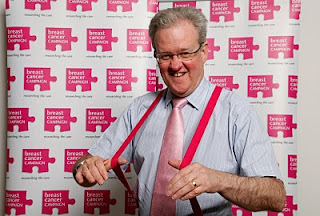 Banff & Buchan MSP Stewart Stevenson has lent his support to the World’s Biggest Coffee Morning which is being held this Friday (24th) by Macmillan Cancer Support with the aim of raising £8 million to help change the lives of people affected by cancer. Last year, 43,000 coffee mornings were held raising £7.9 million and this year’s event aims to go further still. “Events like the World’s Biggest Coffee Morning are an excellent way for everyone to come together and help raise money for a cause that helps vast numbers of people around the country. It has gone from strength to strength over the years and I am delighted that it is now aiming to raise such a substantial sum. “Sadly almost everyone will know someone whose life has been affected by cancer, but the work that Macmillan Cancer Support does is invaluable in improving their circumstances and is a cause thoroughly worth backing. A £5.5m construction contract to improve the safety and efficiency of a key route linking the west coast ports to the rest of Scotland has been announced by Transport Minister Stewart Stevenson. The scheme will provide dedicated safe overtaking opportunities in both directions for nearly 2 miles (1.8 miles/ 3km) between Parkend and Bennane, just to the north of Ballantrae, and is one of a number of upgrades to this vital link from the ferry ports. RJ McLeod (Contractors) Ltd will build the Transport Scotland funded project. “I am delighted to announce the selection of a contractor and the consequential start of construction on this key strategic route which links our west coast ports to the rest of Scotland. “On completion this scheme will provide better overtaking opportunities for A77 traffic, meaning quicker and safer journeys for local communities and tourists, as well as freight traffic. This scheme is part of £60 million of planned investment along the A77 and A75, and complements £29 million already invested on these routes. The 86 mile long A77 is a main link for south west communities and businesses, and this section of the route carries up to 3000 vehicles a day. Work is due to start on site next month, with completion anticipated in spring of 2011. New guidance to help public sector bodies meet their responsibilities under the Climate Change Act has been published. Public bodies are invited to give their views on the guidance, which encourages them to set their own emissions targets and make tackling climate change a priority. Climate Change Minister Stewart Stevenson said the public sector must 'show leadership' by cutting its emissions. "Climate change is one of the greatest challenges the world faces, with significant consequences for the environment, society and the economy. Parliament, with strong support from across civic society and business, last year voted to set the most ambitious climate change targets anywhere in the world. "Scotland's public bodies have a significant influence on emissions, not just directly, but through the goods and services they deliver and procure. They must play their part in tackling climate change and our guidance offers a step-by-step approach which will help bodies to understand their duties and identify the actions they can take to deliver them. "Action to reduce public sector emissions is already underway. Earlier this year, the Government launched an initiative to encourage the use of low carbon vehicles by our public services and NHS Scotland's emissions from buildings' energy use has fallen by 34 per cent on 1990 levels. However, there is still much more to do. "Scotland has already reached the half-way point in achieving our 2020 target of reducing emissions by 42 per cent but even if global emissions follow suit, this will not stop changes to the climate as a result of damage already done. So alongside action to reduce emissions, Scotland also must plan to adapt to the changing climate and Scotland's public bodies should be prepared to build resilience to ensure they can continue to deliver crucial public services." Part 4 of the Climate Change (Scotland) Act 2009 places duties on public bodies relating to climate change, which will commence on 1 January 2011, and a statutory requirement on Scottish Ministers to give guidance to public bodies in relation to those duties. The duties will apply to approximately 5,000 public bodies all defined as a Scottish public authority within the meaning of Section 3(1)(a) of the Freedom of Information (Scotland) Act 2002. The consultation will run for 10 weeks and close on Friday November 26, 2010. New figures on the Small Business Bonus show the SNP’s focus on small businesses as essential to Scottish growth has saved thousands of pounds for firms in the first two years of the scheme. With figures for the bonus for 2010-11 still to come in, local small businesses have saved an average of £1970 each during the recession as a result of the SNP’s business rates policy. “This is excellent news for businesses across Banff & Buchan. “In 2007 the SNP recognised that Scotland’s small businesses had been neglected for too long. Small and medium sized firms are a vital part of Scotland’s economy and we must work together to support them. “The small business bonus has helped keep corner shops and small manufacturing firms open during the recession and now has a key role to play in ensuring Scotland recovers strongly. “While other parties argued against the bonus the SNP is well aware of the importance small businesses play in communities, as employers and in creating growth in our economy. “In the Aberdeenshire Council area businesses have saved an average of £1970 in the first two years of the scheme with another year’s bonus available this year. "While there are serious budget cuts heading to Scotland from Westminster the Small business bonus is something I hope we are able to sustain and that I know from speaking to small businesses in my region that would be very welcome. ‬‪‬‪Banff & Buchan MSP Stewart Stevenson has called for farmers in Banff & Buchan to ensure that their claims are accurate if they are in receipt of Single Farm Payments (SFPs) or Less Favoured Area Support (LFASS). 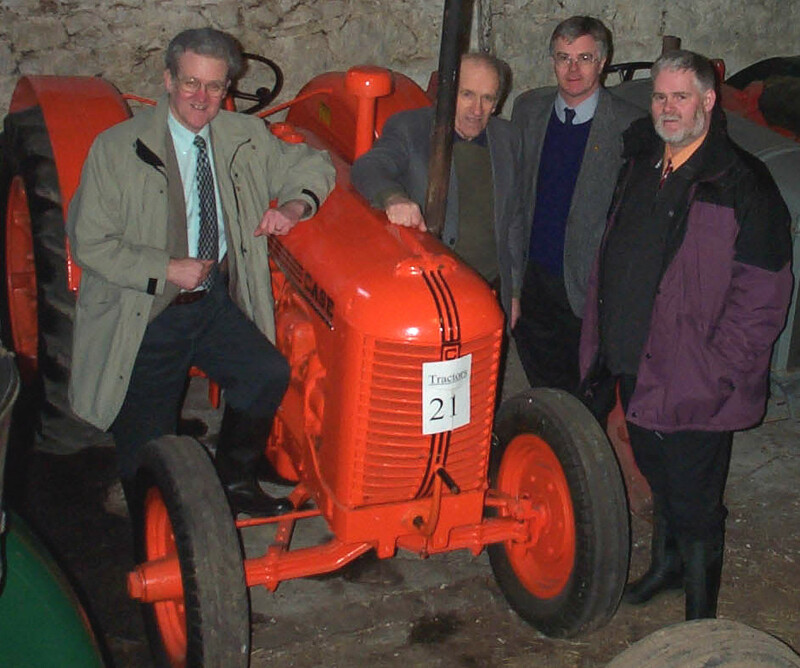 An EU audit of the penalty system in Scotland is requiring the Scottish Government to enforce existing rules on land eligibility fully and classify any claim made on ineligible land as an intentional breach.‬‪Farm businesses that have mistakenly claimed on ineligible land and have not made efforts to rectify their claim are at risk of losing the entirety of their SFP or LFASS funding as a result. Banff & Buchan MSP Stewart Stevenson has welcomed the Scottish Government’s move to legally limit primary 1 class sizes to 25. The regulations follow a consultation earlier this year and are designed to help local authorities to keep class sizes down when faced with placing requests. “The view from the public and from professionals is consistently in favour of reduced class sizes. In Government the SNP has achieved the lowest class-sizes ever seen in Scotland and introducing a legal limit is an important mechanism to support Local Authorities in their delivery of lower class sizes. "Lower class sizes obviously increases teacher contact time and it plays a key role in both raising pupil attainment and improving behaviour in the classroom. “In contrast the Tories continue to refuse to accept that smaller class sizes help education and Labour has no ideas and nothing to offer Scottish pupils, parents or schools. A construction contract worth over £10 million to extend a section of dual carriageway on a lifeline road for the north of Scotland, is set to go ahead with the appointment of a contractor. Transport Minister Stewart Stevenson announced that John Paul Construction will build the Transport Scotland funded project, which will provide a further 3.2 km of dual carriageway on the A9 at Crubenmore. “The Scottish Government is committed to dualling the A9 from Perth to Inverness on a phased basis. As a signal of our commitment, earlier this year the Finance Secretary announced that we would use some of the budget consequentials to fast track the work to extend the dualled section on the A9 at Crubenmore. Located to the south of Newtonmore in Glen Truim, the A9 Crubenmore Dual Carriageway Northern Extension is one of a number of improvement schemes recommended for development to help achieve safer operation and more reliable journey times for the A9. On completion, the scheme will support businesses, communities and tourism throughout Scotland by improving the access to and from Inverness and the Highlands, giving additional guaranteed overtaking opportunities in both directions and reducing both journey times and the number of convoy incidences. The A9 is the longest trunk road in Scotland and serves many different users, from remote communities to key strategic traffic between the central belt and the north of the country. Work is due to start on site this autumn, with completion anticipated in late summer of 2011. Scotland's Transport Minister today welcomed news that airline Jet2.com is to launch new services from Glasgow, creating 150 jobs. Stewart Stevenson was at Glasgow Airport today to announce funding of £150,000 from Scottish Enterprise's Regional Selective Assistance (RSA) scheme towards the creation of nine maintenance jobs at the new Jet2.com base. Scottish Development International has been working with Jet2.com to establish the base, with Jet2.com set to launch flights to nine destinations from Glasgow - Nice, Alicante, Dalaman, Faro, Monastir, Palma, Paphos, Sharm el Sheikh and Tenerife. "This announcement is a tremendous boost for Glasgow Airport, linking the city to new destinations and creating 150 jobs. I am particularly pleased that Scottish Enterprise has been able to offer RSA towards the creation of high-value maintenance jobs. This follows the excellent work of Scottish Development International in persuading Jet2.com to establish these new jobs in Glasgow in the face of competition from other parts of the UK. "As we look to sustain economic recovery and build Scotland's economy for long-term success, it is vital to use job creation tools such as RSA to their full potential." Anne MacColl, interim chief executive, Scottish Development International, said: "It's very encouraging to see new air routes being developed in Scotland and creating new jobs for the economy in the process. "That Jet2.com has chosen to establish a base at Glasgow airport rather than expand further in Manchester or Leeds is testament to the value of SDI's teams who, in the face of tough competition, are successfully promoting Scotland around the globe. It demonstrates just how attractive a location Scotland continues to be for investors. Working in partnership with SE, we've put together a package of support for the company, which includes RSA and Training Plus funding. "RSA funding is one of the key tools we can use to encourage both indigenous and foreign companies to invest in Scotland and we will continue to work closely with Jet2.com in the future to further strengthen its position in Scotland." Four tenderers, comprising seven major construction firms, are set to compete for the contract to upgrade M9 Junction 1a - a vital element of the Forth Replacement Crossing (FRC) scheme. They comprise Morrison Construction and joint ventures from Balfour Beatty and Morgan Sindall; John Sisk & Son Ltd and Roadbridge; and Sir Robert McAlpine Ltd and Costain Ltd. The contract is anticipated to be worth between £46 million - £65 million and will improve connectivity and functionality between the M9 and the new FRC, by widening the M9 at key locations, improving existing slip roads and providing new west facing slip roads. The works also include provision of an Intelligent Transport System (ITS) that will help regulate the flow of traffic approaching the FRC and Newbridge Junction, forming part of a 22 km ITS corridor that extends from M9 Junction 1a to the M90 Halbeath Junction. This ITS will include overhead signal gantries along this corridor providing lane control, variable mandatory speed control and traffic information to drivers via variable message signs (VMS). "This represents another significant milestone in the procurement of the Forth Replacement Crossing and demonstrates that, subject to the approval of the Forth Crossing Bill by the Scottish Parliament, the project remains on schedule for delivery on time and within budget by 2016. “It is very pleasing to see the enthusiasm demonstrated by the construction industry in bidding for the FRC principal contract has also extended to the M9 Junction 1a work, delivering a field of high-quality, experienced candidates. Transport Scotland received six prequalification submissions following the publication of the Contract Notice on 8 June 2010. The top four submissions were determined following an assessment of each applicant’s financial and technical capabilities. It is intended that these four will enter into competitive dialogue with Transport Scotland in November to discuss their proposals, before submitting a final tender in Spring 2011. It is anticipated the award of the M9 Junction 1a contract will then be made in July 2011 with construction expected to begin soon after. Banff & Buchan MSP Stewart Stevenson and MP Dr Eilidh Whiteford both took the opportunity to meet with key figures from the fishing industry last night at an event hosted by Seafood Scotland to highlight the efforts of the Scottish fishing industry to adopt sustainable practices. 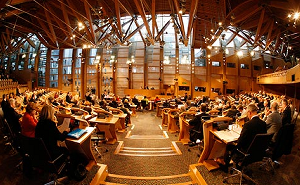 The event featured live cooking demonstrations and was supported by the Scottish Government’s “Eat More Fish” campaign. “The Scottish Parliament event was exceptionally well attended and was an excellent opportunity for key figures in the fishing industry to highlight the extremely challenging circumstances the industry is facing to lawmakers in Edinburgh. “The fishing industry has a positive story to tell when it comes to the sustainability measures it has adopted, but there is no doubt that these are extremely hard times. A cycle hire initiative to provide greener, healthier travel options was launched in Dumfries today by Transport Minister, Stewart Stevenson. The £155,000 BIKE2Go scheme is the first of its kind to be introduced in Scotland. It provides bicycles free of charge to subscribers from nine locations across the town to boost cycling numbers, reducing emissions and promoting healthy activity. The initiative is complemented with a new £150,000 Cycling Scotland interest free loan scheme that will assist private sector businesses across Scotland with the cost of installing workplace cycling facilities, such as bike shelters and on-site changing facilities. “I’m delighted to be launching both of these initiatives to encourage people to get out of their cars and onto their bicycles. Scotland has established world-leading targets to cut greenhouse gas emissions and providing more sustainable transport alternatives will help us meet those targets. We are also committed to improving our nation’s health, and our investment in these schemes underlines our commitment to achieving these goals. The scheme is part of the Scottish Government’s Smarter Choices, Smarter Places (SCSP) programme, one of a number of initiatives to encourage people to make the switch to a more sustainable transport method and to meet the vision for 10% of all journeys to be made by bicycle by 2020. BIKE2Go, which is based on similar successful models in Paris, Barcelona, Stockholm and London, joins other cycle schemes across Scotland ranging from providing bikes on a trial basis in Dundee and Glasgow, improved bike storage in Falkirk, discount cycle schemes in Orkney and East Dunbartonshire, improved bicycle routes along the River Clyde and improving cycle skill sessions in East Renfrewshire. Managed by SWestrans (South West Regional Transport Partnership) under its GoSmart Dumfries banner, the BIKE2Go scheme has 30 bikes available free of charge for half an hour, with an hourly rental fee of £1 for longer use. There is a £10 annual subscription for the scheme. Greenhouse gas emissions in Scotland have fallen by 20 per cent since 1990, according to the latest official statistics published today. The figures show a 3 per cent reduction between 2007 and 2008 with total emissions falling from 57.8 million tonnes CO2 equivalent (Mt CO2e) in 2007 to 56.1 million (Mt CO2e), in 2008. Taking emissions trading into account, Scotland's emissions have fallen by 21.2 per cent from 1990 - meaning Scotland has reached the halfway point in achieving its 2020 Climate Change Act target of reducing emissions by 42 per cent. "These figures demonstrate the excellent progress we are making towards achieving our world leading climate change targets. "Our energy sector is playing a leading role in the drive to reduce emissions with nearly a quarter of Scotland's electricity demand met by renewables during 2008. Since 2008 there has been significant investment in the sector with the round of leases for marine projects in the Pentland Firth and sites across Scotland set to deliver offshore wind capacity of 10.6GW. This additional investment means electricity generated from renewable sources will play an even greater role as we strive to reduce emissions even further. "Everyone from Government, business, industry and individuals will need to play their part to ensure we deliver a low carbon Scotland and meet our ambitious climate targets. "We recognise the challenge presented by rising transport emissions which is why we are investing record levels building new rail lines, improving the bus network and rolling out new cycle and walking paths across Scotland. "We will continue our efforts to influence the EU and international community to increase their ambitions through our work with the Climate Group's States and Regions Alliance, and with our partners in the UK Government. And later this year we will set out proposals to set us on the trajectory towards a low carbon Scotland." Banff & Buchan MSP Stewart Stevenson has welcomed statistics published which show that dental registrations have increased substantially across the North-east of Scotland since the SNP came to power. As of June 2010, there are now 13,260 more children and 56,726 more adults registered with a dentist in NHS Grampian than in March 2007. “The figures released show the progress under the SNP of increasing the number of children and adults registered with a dentist. “The SNP were elected on a commitment to create a healthier Scotland and these statistics show we are doing just that. By getting more children registered with a dentist it will help their dental hygiene through the rest of their life. 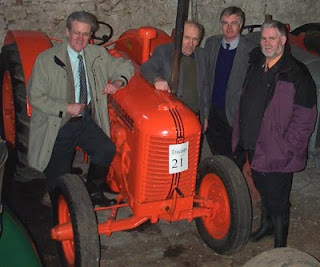 Scottish National Party MSP Stewart Stevenson has welcomed the change of policy from HM Revenue & Customs (HMRC) on the use of tractors at agricultural shows in respect of red diesel. Mr Stevenson had previously written to the then Chancellor of the Exchequer Alistair Darling in 2008 following concerns that a heavy-handed approach taken to shows in the North of England could spread to the North-east of Scotland. Officials at the Wooler Show in Northumberland were left stunned when they were told by HMRC officials that farmers who volunteered to help set up the show using their tractors would be penalised for using red diesel. HMRC then suggested to the show that it should buy its own tractor for the 2-3 hours work which it would be required for each year. Mr Stevenson received an assurance from HMRC that the policy would be reviewed. NFU Scotland and their counterparts in England and Wales have been working with HMRC on the new policy. "This is very good news and represents a welcome, common sense decision by the tax authorities. “When I raised this matter back in 2008, HMRC has recognised that its activities at and around agricultural shows could have been seen as heavy handed and agreed that the advice given to go out and buy a tractor was disproportionate. “The original advice from HMRC - that agricultural shows should consider buying a cheap second-hand tractor - was completely inappropriate. I am delighted that we have reached this sensible position." Banff & Buchan MSP Stewart Stevenson has hit out at the Tory-Lib Dem Coalition's imposition of a secret budget cut through increased VAT and National Insurance on public services. In the election the Tories claimed they would scrap Labour’s tax on jobs and David Cameron told the SNP that Tory action on National Insurance would save the NHS money. Instead their failure to scrap the National Insurance rise and the increase in VAT to 20% will see NHS Grampian, Grampian Police, Aberdeenshire Council, the local Fire & Rescue service and other public bodies forking out millions in additional taxation costs. The end product can only be a reduction in public services to cover the additional costs imposed by the Westminster Government. The failure to scrap the National Insurance rise sees the Tories break one of their key election pledges and will leave not only public services but local business out of pocket. Information on the cost to public services such as the NHS, Police and Fire Services of the tax hikes has been obtained through a series of Parliamentary Questions. “The Tories and Lib Dems are trying to secretly slash local budgets by clawing back millions in taxes to the Treasury from the North-east of Scotland alone. That is in addition to the budget cuts they intend to impose. “This is the Tories' hidden tax hike. In the election the Tories promised to scrap Labour’s tax on jobs. In office they went back on that promise. “National Insurance is to increase by 1% and Scotland’s public services will face a massive bill. The cost to our businesses could be even higher. “Cutting the budget and increasing the taxes is a double whammy for the public sector. We are all well aware of the need to cut back on public expenditure but we cannot allow the public sector to be decimated while billions of pounds are wasted on new nuclear missiles. “In Parliament the Prime Minister claimed he had saved Scotland’s NHS money, in fact he is sending the NHS a tax bill for tens of millions of pounds.